Final Project 1, Origins of Joan of Arc: Saint or Insane? George Bernard Shaw famously described her as “the queerest fish among the eccentric worthies of the Middle Ages” (Shaw 1924) after Mark Twain had characterized her as “by far the most extraordinary person the human race has ever produced” (Twain 1896). For my final project, I will be doing a blog series focused on Joan of Arc. As an introductory blog post, I will first be focusing on Joan’s origins and pre-battle history, as well as give some commentary on whether or not she was sane. Joan was born in 1412 to a French farmer family, living in Domremy, a French Crown loyalist area despite being surrounded by pro-English lands during the Hundred Years’ War. There was much civil unrest surrounding her home and there is evidence to suggest that her village was burned down at least once due to the conflict during her childhood. At her cross-examination during her Heresy trial, Joan reported to hearing divine voices at each thirteen, “I was thirteen when I had a Voice from God for my help and guidance. The first time that I heard this Voice, I was very much frightened; it was mid-day, in the summer, in my father’s garden” (Official Transcript, Translated). She later explained that she frequently heard divine voices and had visions of Saint Michael, Saint Catherine, and Saint Margaret. According to Joan, these saints told her to unify the French people by driving out the English. At the age of 16 or 17, with the help of a relative, she met with a series of French officials, all with the goal of speaking with the French Crown. Eventually, she met with Charles VII (who had not yet been crowned) and “overwhelmed him with her passion and conviction” (Pettinger 2007). Charles sent her to Siege of Orléans, where Joan defeated the English in nine days. The above picture depicts an artistic interpretation of Joan in 1485, as the only surviving paining of Joan has been lost. Condemned as a heretic by a pro-English Bishop and later made a Saint by the Roman Catholic Church, much discussion has been made regarding Joan’s sanity. Depending on the individual’s religious inclinations and lens of analysis, conclusions vary. There is no denying Joan’s fervent belief in her visions, which she rigorously defended at her trial. However, it is also important to note that while Joan claimed to have begun having visions at age thirteen, she did not immediately speak of them. Her willingness to express them coincided with her growing passion to drive the English out of France. Thus, according to him, Joan’s supernatural visions were an acceptable justification in that time for such a great military undertaking. Supported by Joan’s passion and direction, these divine claims were difficult to dismiss. Perhaps, if the young girl had been less fervent in her military vision, such divine manifestations would have been doubted, but her determination and success made it not so. Ultimately, whether or not these visions actually happened is irrelevant: Joan’s behavior demonstrated a rational, however passionate, mindset which enabled her to lead significant military victories. A.S. “Joan of Arc.” British Medical Journal (1941): 417. Online. Pernoud, Régine. Joan of Arc: By Herself and Her Witnesses. Lanham: Scarborough House, 1964. Pettinger, Tejvan. Biography of Joan of Arc. 25 June 2007. Online. 24 April 2014. Shaw, George Bernard. 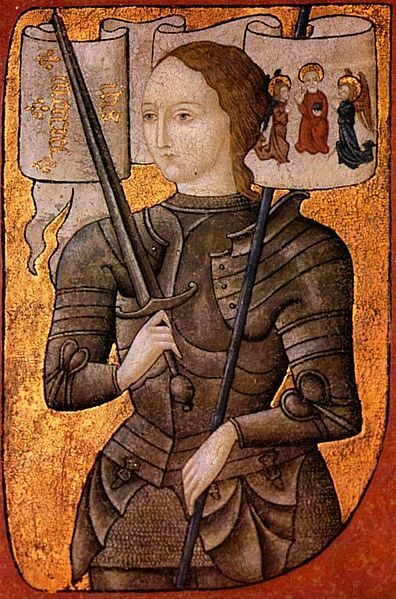 Saint Joan. Manhattan : Penguin Classics, 1924. Twain, Mark. “Saint Joan of Arc.” Twain, Mark. Personal Recollections of Joan of Arc. United States: Harper & Brothers, 1896.